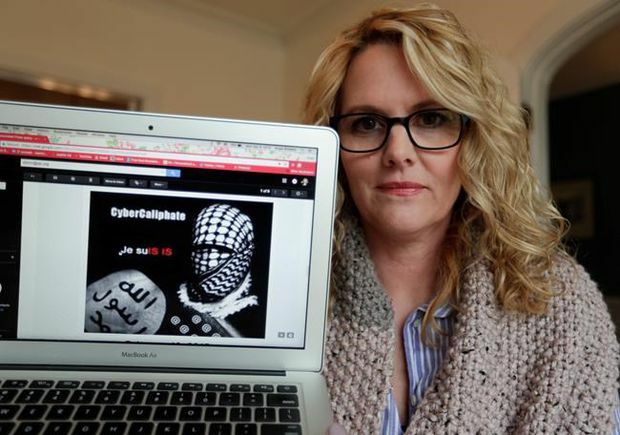 In this April 9, 2018, photo, Angela Ricketts poses with a screen shot of a message she received from a group claiming to be Islamic State supporters, in Bloomington, Ind. Proof that the military wives were targeted by Russian hackers is laid out in a digital hit list provided to the AP by the cybersecurity company Secureworks last year. The AP has previously used the list of 4,700 Gmail addresses to outline the group’s espionage campaign against journalists , defence contractors and U.S. officials . More recent AP research has found that Fancy Bear, which Secureworks dubs “Iron Twilight,” was actively trying to break into the military wives’ mailboxes around the time that CyberCaliphate struck. The trolls — Russian employees paid to seed American social media with disinformation — often hyped the threat of Islamic State militants to the United States. A few months before CyberCaliphate first won attention by hijacking various media organizations’ Twitter accounts, for example, the trolls were spreading false rumours about an Islamic State attack in Louisiana and a counterfeit video appearing to show an American soldier firing into a Qur’an .